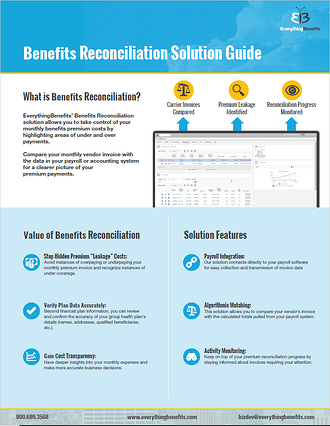 EverythingBenefits’ Benefits Reconciliation solution allows you to take control of your monthly premium costs by highlighting areas of under and overpayments. Compare your monthly vendor invoice with the data in your payroll or accounting system for a clearer picture of your premium payments. Download the Benefits Reconciliation Solution Guide! Simply fill out the form below to access your free content.